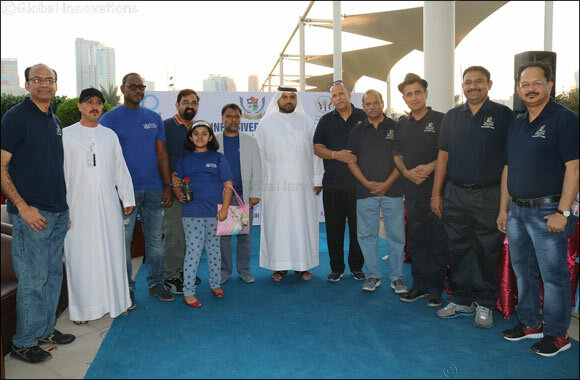 Skyline University College has successfully conducted the UN World Water Day celebration in cooperation with SHUROOQ and Sharjah Electricity and Water Authority (SEWA) on March 22, 2018 at Al Majaz Waterfront Park, Sharjah UAE. Competitions on painting, poster-making, video jingle were organized for children in line with this year’s UN World Water Day theme, “Nature of Water,” and was followed by an awareness walk around Al Majaz Park by SUC faculty, staff, students, and event guests. Among the important guests who graced the event were, Ms. Fatima Zaabi, Director of Communication and Social Services, Environment and Protected Area Authority (EPAA); Mr. Rashid Ali Marzoughi of Sharjah Electricity and Water Authority (SEWA) and; Mr. Mohammed Al Mazroui, Destination Manager, Al Majaz Waterfront. The event’s official partners were: Bee’ah, Cool and Cool, Ramada Hotel, and IFFCO (Tiffany). The annual celebration of UN World Water Day of SUC is organized by Community Services Committee chaired by Dr. Taleb Eli along with Dr. Mohammad Abdul Salam, Community Services Committee Coordinator.